A mother has detected her toddler’s eye cancer after spotting a bizarre white spot in his eye in a photograph. Emily Smith (23) from Bognor Regis, West Sussex, in the south of England, took a close-up photo of her son, Jaxson, and noticed a strange area on one of his pupils. Emily, a mental health care worker, said: “The flash on my camera automatically came on as Jaxon was in the dark. “He looked so cute but when I looked at the picture I noticed the strange clouding behind one of his pupils. “After this I googled it and looked at previous photos, and we also noticed the white reflex,” she recalls. Following the discovery she took Jaxson (then 11 months old) to the doctor where he was referred to eye specialists. The little boy was later diagnosed with retinoblastoma, a rare form of eye cancer, which may not have been discovered if his mom hadn’t taken the photograph. “We booked a doctor’s appointment the following day and upon telling the doctor our concerns she performed a red reflex test on Jaxson. The results confirmed there was something behind his eye. And that’s where the nightmare began. Following the GP’s visit Jaxson was put forward for an emergency referral at St Richards Hospital eye clinic. “An ophthalmologist looked into Jaxson’s eye with a special scope and immediately asked a senior clinician for their advice. “They told us that Jaxson could have cancer and that we’d immediately be referred to the Royal London Hospital to see the retinoblastoma specialist [who’d perform a procedure to gain more clarity on the issue]. During the procedure surgeons used a special magnification scope to look into the back of Jaxson’s eye through the pupil to check the retina for the tumour. They also took photos and measurements. They then gave it a grade of severity and checked if it had grown or spread close to the back of the eye. “Waiting for Jaxson to come round was horrific. It was only an hour, but it felt so much longer. “Luckily, following his surgery, Jaxson was pleasantly unaware of what was going on and continued to be our happy, beautiful baby boy. “We couldn’t have been more proud of him as he underwent this lifesaving surgery and treatment,” Emily said. Doctors did an MRI scan and confirmed Jaxson’s cancer wasn’t spreading. He then went on to receive six rounds of systemic chemotherapy at Southampton General Hospital. In July 2017, Emily and her partner, Owen Scrivens (23), received the good news that Jaxson’s tumour had become stable and he didn’t required any more treatment. But five months later they were told he’d relapsed. 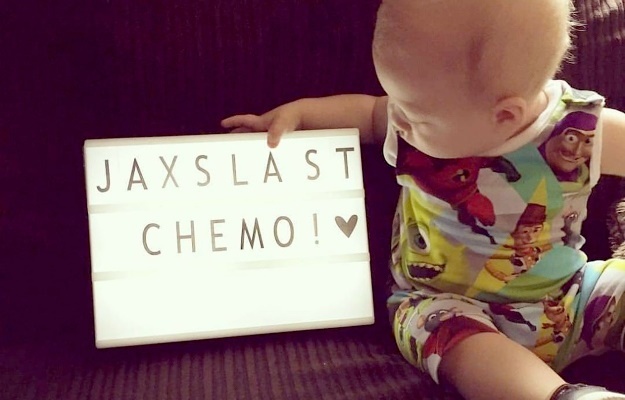 “We were heartbroken finding out it was beginning to grow again, despite Jaxson reacting so well to his previous treatment. After a difficult few years, Emily and Owen finally received the news they wanted to hear – Jaxson was stable once again. “Jaxson’s school said he’s on track for everything development-wise with no concerns. I think we’ve always been aware that he may struggle due to being premature and also an oncology patient but we couldn’t be more proud of our gorgeous little boy. “Even if he was behind, we’d still be just as proud. But to know despite it all he’s still so kind and clever is extraordinary."